This quick and easy pasta recipe calls for orecchiette which translates to "little ears." With the flavorful mix of Italian sausage, vegetables, and pasta, all you need is a salad and some crusty bread to complete the meal. 1 of 2 Cook orecchiette in boiling salted water for 6 minutes. Add broccoli; cook 6 more minutes. Drain; transfer to a serving bowl. 2 of 2 Meanwhile, heat a large skillet over medium-high heat. Remove sausage from its casing and crumble into pan. Cook for 5 minutes or until no longer pink. Remove from skillet and drain off excess fat. Reduce heat to medium and add peppers to skillet and cook for 3 minutes. 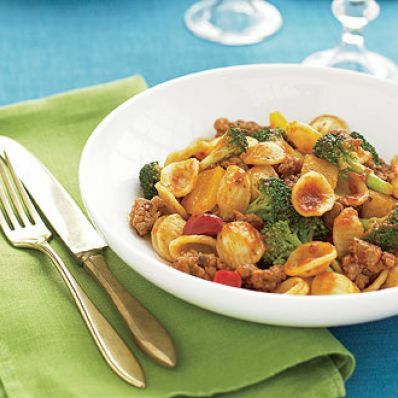 Add sausage, peppers and marinara sauce to serving bowl with pasta and broccoli, and toss.